This family friendly home is located in a traditional neighborhood of South Lake Tahoe and will give you a local experience. Far enough from the busy areas of the city but still within easy reach of restaurants, shopping, bars etc. Inside the home you will find an updated kitchen with stainless steel appliances and beautiful floors throughout.The mountain themed decor gives this home a warm and welcoming cabin feeling. 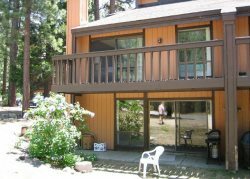 This house is on the Western side of South Lake Tahoe, close to Camp Richardson, Fallen Leaf Lake and Mount Tallac. Heavenly and the casinos are only about 15 minutes by car. board games, puzzles, Jenga, cards and other games.